The Metropole Theatre at Numbers 12 and 13 Tavistock Street was opened in 1894 as the Empire Theatre. in Tavistock Street, Devonport, unknown date. 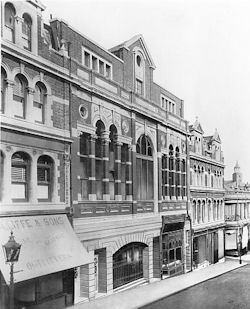 It was re-opened by Messrs Arthur Roscoe Carlton and Edward Leeds as the New Metropole Theatre on Monday August 24th 1896. Mr F R Benson's Shakespearean and Old English Comedy Company had been engaged to perform "The Taming of the Shrew" on Monday, "The Merchant of Venice" on Tuesday, "Hamlet" on Wednesday, "Twelfth Night" on Thursday, "She Stoops to Conquer" on Friday and ended the week with "Richard III" on the Saturday. By October 1897 Mr Arthur Carlton was the sole lessee and on January 9th 1899 he purchased both the Theatre and the adjacent shops. In a letter dated December 15th 1903, Mr Carlton asked Devonport Corporation for a quotation for the supply of 'electric energy' and when his manager, Mr G King, applied to the Corporation in September 1911 for a renewal of the Theatre's licence, a Councillor described the building as kept 'clean and in a good state'. The arrival of the silent films must have inspired Mr Carlton to change over to a cinema. On June 20th 1912 Devonport Corporation granted Mr King a cinema licence 'subject completed works'. On August 5th 1912 the Theatre once again had a re-opening but this time under the name of the Palladium. It is this unfortunate choice of name that has for decades caused confusion over the opening of the Palladium Cinema at Ford. After some short-term changes of name and a period of closure, the Metropole Theatre eventually became the New Alhambra Theatre.